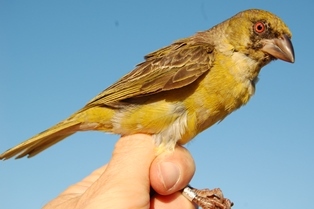 On 2 Oct 2009 I ringed 2 Southern Masked Weaver nestlings in a colony of bamboos in Elfindale, Cape Town (same colony photographed in different years, see here). The older chick, ring BE58110, has been recaptured 3 times during normal mist-netting. In its first year, the bird had partial breeding plumage. 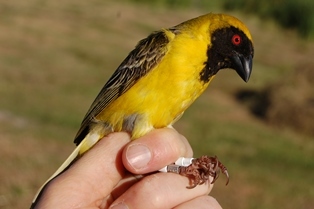 From its second year it obtains full breeding plumage, as shown in its fourth year below. 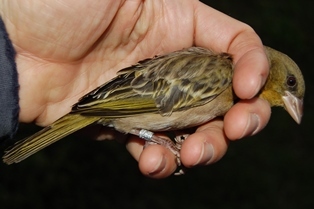 Read more about the ringing of the weaver chicks here and about earlier results here.